Since 2005, there have been several discoveries of soft tissue in fossils that are supposedly millions of years old (see here, here, here, here, here, and here). From a young-earth perspective, this is interesting, because it is hard to understand how soft tissue could be preserved for millions and millions of years. Dr. Mary Schweitzer has attempted to provide a mechanism for such preservation, but it isn’t applicable in the real world. If nothing else, I can safely say that finding such tissue was surprising to those who believe the fossils are millions of years old, but it wasn’t surprising to those of us who think the fossils are only thousands of years old. Recently, I ran across a very interesting study that adds to the list of surprises for those who think that some fossils are millions of years old. The authors were analyzing the fossilized shells of an extinct group of marine mollusks from the genus Ecphora. 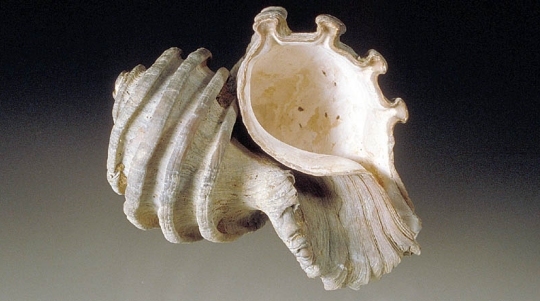 Unlike many mollusk groups, the fossilized shells of the Ecphora are colored reddish-brown. The authors decided to find out what produces this colorization, so they soaked the fossils in weak acid to remove the minerals. What remained were thin sheets of organic residue that had all the characteristics one would expect if they were made of proteins. …the organic matter elemental and isotopic compositions are very similar to those from modern marine invertebrates. We conclude, therefore, that essentially intact shell-binding proteins have been preserved for up to 18 Ma. This is significant, because even at temperatures of zero degrees Celsius, the hardiest proteins are not expected to be detectable in organic samples that are more than about 3 million years old.2 Nevertheless, the authors found lots of essentially intact proteins in fossils that are supposed to be up to 18 million years old! This isn’t the first time researchers have claimed to find protein in supposedly ancient fossils. About two years ago, Robert R. Reisz and his colleagues were examining fossilized dinosaur eggs that are supposed to be about 190-200 million years old.3 They found organic residue that they thought was made of protein. However, they didn’t do nearly as detailed an analysis, so they couldn’t really say how intact the protein was. In addition, they interpreted it to be collagen, and that’s a pretty hardy protein. Dr. Rana from Reasons to believe, for example, thinks that collagen is durable enough for fragments of it to survive for millions of years. In this current study of Ecphora fossils, however, the researchers didn’t find fragments. They found essentially intact proteins. Also, these shell-binding proteins shouldn’t be as durable as collagen, because they don’t have the same triple-helix structure. It seems to me that if you want to believe these fossils are millions of years old, you need to come up with some mechanism by which proteins can stay intact for so long. Now I do have to point out two things. First, there was probably some decay in the proteins of these fossils, because the chemical analysis indicated that they didn’t have as much nitrogen in them as they should have. I would suspect that means some of the proteins had decayed, but others had not. Second, most fossilized mollusk shells are chalky white, which probably means they don’t contain any intact proteins. As a result, it is reasonable to conclude that there is something about Ecphora shells that helps them preserve their proteins. I hope more analysis eventually finds the process by which such preservation takes place, because that would help us get a better handle on the upper age limit of such fossils. I’m curious about one thing. Do you ever think that the multiple lines of evidence for the age of the universe can ever compress into a time frame of under 10 Ka? Because it seems to me that any time-frame more than that is a defeater for YEC, but simply changes the age for OEC. Even if some systematic error(s) cause(s) all age estimates to be out by 5 OM (which is a huge amount); that is still well outside of the range which YEC can tolerate. And such a find is unlikely to ever eventuate. So essentially, you have to accept that age estimates are wrong by about 6 OM to be in the YEC ballpark. Whereas the age discrepancy for these fossils at 3 Ma vs 18 Ma is only a factor of 6, less than 1 OM, so even a 1 OM reduction would account for this data. To me the most likely explanation is that there is some preservation process we don’t yet know about, as opposed to thinking all the other lines of evidence are out by a factor of a million. I guess I could ask you a similar question, Lawrence. Do you think the multiple lines of evidence for a young earth can ever be stretched into a timeframe of billions of years? In my view, it’s not a question of systematic errors when it comes to the old-earth dating methods. It’s a question of flawed assumptions. Every one of these dating methods has built-in assumptions, and in some cases, we know those assumptions are incorrect. Thus, in my view, they give us incorrect answers for the age of the earth/universe. I would also point out that we aren’t talking about a factor of 6 in this discrepancy. In order to expect that collagen (a hardy protein) can still remain detectable after about 3 million years, you have to believe that the fossils were at zero degrees Celsius the entire time, and most likely, they never reached that low a temperature. If the temperature averaged 10 degrees Celsius, then reference 2 tells us that collagen becomes undetectable after only 180,000 years. That’s a problem of two orders of magnitude, and that’s for a far less fragile protein than the ones in this study. Thus, the problem this study poses for old-earth assumptions is probably significantly greater than two orders of magnitude. I am also not sure what you mean when you say that any time-frame more than 10 Ka is a “defeater” for YEC. Dr. John Sanford, one of the world’s most important figures in genetics, considers himself a young-earth creationist, and he says that the earth is less than 100,000 years old. In Creation and Time, Dr. Hugh Ross discusses several different ways people have tried to use the Bible to date the earth, and the estimates range from 6,000 years to 60,000 years old (p. 140). I would call all of those “young earth” views. In the end, my goal isn’t to “compress” any lines of evidence. My goal is to find the evidence that is most reliable and follow it. Right now, my assessment is that the most reliable evidence points to a young earth. Fair enough. I keep forgetting you’re a different, more measured and reasonable person than those who insist the Earth is 6 Kya to *perhaps* 10 Kya and insist that everyone who thinks otherwise is a “compromiser”. I know you’ve written before on small and cyclical changes in the decay rate of some isotopes; while those would mean a somewhat larger error bar, they wouldn’t translate to 5 OM changes in the ages. Is that what you mean by “in some cases, we know those assumptions are incorrect”? If so that is perhaps a little too strong of a statement, in the context. Also, to be completely fair, Dr Ross was providing a date for the origin of *mankind*, not the Earth or the Universe. If I was pressed, I think I would say that the majority of the evidence points to an old creation, and some evidence indicates it might possible be somewhat younger relatively speaking; but little evidence indicates anything that could be considered YEC in the few-thousand-years time-frame. But perhaps that’s because the young-earth proponents I’ve read (and I read them a lot) spend the majority of their time and words on (rather poorly for the most part) refuting the evidence for an old age instead of providing compelling evidence for a young age (present company excluded :-)). Like you, I am perfectly prepared the follow the evidence where it leads, and that’s why I am convinced of an old-age now; that might change as more is discovered. Yes, I am different from most young-earth creationists in the sense that I understand there is no reason to think someone who believes in an old earth is a “compromiser”! You are also right that Dr. Ross was providing a date for the origin of mankind, not the universe. However, in a young-earth view, the difference is only six days! Dr Wile, do you know if the researchers found any evidence of iron particles in the tissue they examined? I also wanted to let you know that when I clicked on reference number one I got a big warning from McAfee that it was an unsafe site. For that reason I have not visited the site yet. There was no mention of iron in the protein sheets, Bill. I understand why you are asking, since Schweitzer’s attempt to explain soft tissue preservation involved iron particles. However, as I mention in this discussion, one of the most striking examples of soft tissue in dinosaur fossils shows no evidence of iron particles at all. Since the soft tissue was examined with an electron microscope, you would expect those particles to show up if they are there. The authors do suggest that some interaction between the minerals in the shells and the proteins help to stabilize the proteins from decay, but they don’t provide any evidence for such an interaction. I am not sure why you are getting a warning from McAfee on that. It is a link directly to the Geochemical Perspectives Letters website. I don’t get any warning when I go there. Obviously supposedly 60 – 70 million yr old Dino [& other] fossils that still have soft organic tissue structures in them, w some even C14 dated to LESS than 60,000 yrs [= less then 1/1000th of their supposed age], = a serious dilemma for the Darwinian paradigm. Dr Mary Schweitzer, who was one of the first to document this type of soft tissue in dino fossils, claims that microscopic iron deposits may have acted to preserve this tissue, but that’s been shown to be viable for only several yrs or so- NOT for 10s millions of yrs. – IMO there’s another alternative besides the Darwinian claim that ALL dinos went extinct 60 – 70 million yr ago [vs- ‘Young Earth’ Creationists’ view that dinos were on Noah’s Ark… Watching a ‘Discovery Channel’ simulation of the event that allegedly triggered the extinction of ALL dinos 60 – 70 millions yrs ago via an alleged massive meteor strike off the Yucatan Peninsula, IMO what was described [assuming such an event occurred] was effectively a ‘Global Killer’- which would have killed off more than just dinos! IMO it would have also killed off nearly every macroscopic animal life-form larger than insects on land, air & in the sea, along w nearly all plant-life- possibly sparing some deep-sea creatures. Thus IMO the main problem w this standard scenario [which only became the standard view after 1970, prior to that most large craters were assumed to be extinct volcanoes] is- It’s effectively Over-Kill!!! – IMO a much better scenario is one that would mainly ‘target’ dinos, while leaving most other co-existent animal life-forms intact, especially mammals- while also explaining the preservation of soft organic tissue in dino fossils. Thus assuming the Yucatan meteor strike did occur, IMO it likely killed many / most [species?] of- yet NOT ALL dinos. IMO at least a small number of various dinos survived, that eventually roamed out of the tropics into more northern temperate regions [ala the largest land-mammals now found only in the tropical regions of Africa & Asia IE: the elephant, rhino & hippo]. But approx 2 million yrs ago [the standard estimate] came the on-set of the last Ice-Age, to which dinos would have been uniquely vulnerable- as compared to land-mammals many of which still live in the far north’s snowy climes. As large as wholly mammoths, rhinos & hippos are, dinos on aver were often much larger- a distinct disadvantage for them in cold-snowy weather re: finding suitable shelter &/or trying to migrate back to warmer climes thru deep-snow. Furthermore suitable food-sources for dinos would have become scarce &/or difficult to obtain [IE: vegetation would be buried in deep-snow]. Plus unlike mammals, dinos were NOT [truly] warm-blooded & lacked coats of [thick] fur, both of which are distinct advantages for mammals that can live in cold &/or snowy weather. – Thus IMO the on-set of the last Ice-Age was likely the ultimate extinction event for [the few remaining?] dinos, yet those huge ice-age glaciers [up to 2mi thick] could ‘deep-freeze’ dino bones for several 100s of thousands to up to 1 – 2 million yrs [para-quoting from the article: ‘At temps of 0*C, the hardiest proteins may be detectable in organic samples that are not more than 3 million yrs old.’]. With the end of the ice age- estimated at 20,000 to 8000 yrs ago- dino bones could have become fossilized in hardened mud, & Dr Schweitzer’s proposed iron deposit preservative modality possibly kicked in to preserve soft tissue in dino fossils for the final 10,000 – 40,000 yrs or so. [Note: My scenario does NOT necessarily explain why some dino fossils have been C14 dated to less than 50,000 yrs. But for now I’ll leave that for Darwinists to ponder. Is there a primer for soft tissue for lay-people? It seems like this is incredible support for YEC but it is confusing (besides the info being suppressed). What exactly is present in these samples and what does it mean? I read of soft tissue, red blood cells, iron oxide, DNA, carbon, organic residue, proteins, amino acids, collagen, nitrogen, flexible structures, osteocyte cells, et al. I know this is the realm of experts, but the evidence is powerful and as such I would be thankful if there would be at least a concise, reasonably accessible in a digestible format for ‘normal folks’, such as to share with high school level kids. Haven’t found it yet. The opponents of creation are doing well at muddying the soft tissue waters with their ‘explanations’. I have been following these stories and I am ready to give up b/c I’m confused and don’t have the time and/or intellect to sort it all out. In my mind it is getting relegated to just common sense that a ‘soft tissue’ can’t survive 1/2 a billion years. I guess I would recommend the articles I wrote on the subject, John :). They are linked at the beginning of this article. I agree that it’s hard to wade through it all, because those who are committed to an old earth do everything they can to discount or downplay the findings, while those who are committed to a young earth sometimes overstate the case. Thanks for the reply Dr Wile. I was able to get in to reference one this afternoon without the warnings and was able to read the article. Since the authors were using a scanning electron microscope it is less likely that they would see iron particles. If my understanding is correct, Dr Schweitzer was only able to see those particles with a transmission EM and not with a scanning EM. In thinking more about my question it seems unlikely that a mollusk shell would have enough of a vascular supply to soak the tissue in a concentrated hemoglobin solution post mortem. If that is the case then it is now necessary to have a second mechanism for preserving tissues for millions of years. To me at least, that seems highly improbable. It’s actually possible that the Ecphora didn’t even have iron in their blood, because some mollusks use copper, not iron, to transport oxygen in the blood. Also, it’s hard to understand how anything from the blood could penetrate the shell in any significant amount so as to get to the proteins that are embedded in it. Thanks again for the reply Dr Wile. Is it possible that copper could act in a manner similar to iron in preserving tissue if it could be concentrated sufficiently in the shell? Would you also explain what you mean by your last sentence in a little more detail please. Since I am not really sure how iron preserves soft tissue, I can’t say whether or not copper could do the same thing. There are some chemical processes that copper can do as well as iron, but in most situations, copper is not a good substitute for iron. My last sentence deals with the fact that these protein sheets were found embedded in the shell. Remember, the shells had to be soaked in a weak acid to get rid of the mineral part of the shell. If copper (or iron or anything else) is going to preserve those proteins, it must get into the shell where the proteins are found. If a mollusk dies and all the blood is released, won’t just soak into the shell, at least not in any significant quantity. After all, the purpose of the shell is to keep outside things out and inside things in. Thus, it doesn’t absorb chemicals very well. So even if there were a lot of copper or iron in the mollusks’ blood, I am not sure how it would get to the protein sheets to preserve them. I’ve been keeping a list for a while now, and will copy it to a post after this. Perhaps the most fascinating item I’ve seen is this link to an article by Charles Dickens in 1865 on the life of Mary Anning,the British fossil collector. I was amazed to find Dickens talking about fossil squid ink fresh enough to be used in fountain pens, and ichtyosaur eye lenses so well preserved that they were used as magnifiers. Thanks so much, SJ! I had never heard that Dickens mentioned such things. That is incredibly fascinating. Thanks for the list as well. It is very thorough. I appreciate the clarification Dr Wile. It looks like a different preservation method will be needed to explain the findings. Again, I find it highly improbable to have multiple methods of million year plus preservation for soft tissues. I have found this website helpful in tracking down links and bibliographic information on this issue. I take it you do not find Rana’s take on collagen convincing. I don’t remember you dealing with his position. What would be your response? Seems that undercuts Rana. Does he really think collagen can last +10 million years? Sorry, I had forgot about the attempts to make the protein last. Is it your opinion that this is a close to airtight case? At a temperature of 0 C, collagen decays to being undetectable in 2.7 million years. At a temperature of 10 C, collagen decays to being undetectable in 180,000 years. At a temperature of 15 C, collagen decays to being undetectable in 15,000 years. Now…no one thinks any of these fossils spent much (or any) time at 0 C. However, even at 0 C, collagen cannot survive for the age these Ecphora are supposed to be. This is a particular problem, because collagen is more resistant to decay than the proteins found in these Ecphora. I respect Dr. Rana a lot, but in this case, he doesn’t seem to be aware of the work that has been done on biomolecule decay. Thanks, Dr. wile. I re read your pieces on this, and a couple of other articles, then I re read Rana, and it seemed he was replacing assertion for argument. Keep up the good work. Your blog is one of my favorites.